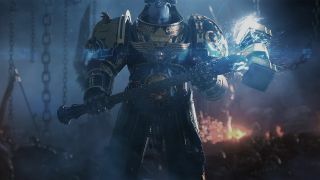 A Warhammer 40K action RPG that's almost good. For a moment, popping out of cover to snipe a demon in the bowels of an Imperial ship, Inquisitor—Martyr feels like a good Warhammer 40,000 game that's bringing new ideas to the action RPG genre. I'm surrounded by half a dozen Imperial Guardsmen laying down laser fire on a swarm of little gremlin-like nurglings. I press tab to switch to a chainsword and shield and charge a Chaos hero. Nearby a Space Marine charges into some Chaos zombies and starts squashing them happily. It's a fleeting few seconds, though. I retreat and try to take cover, which requires you to find a yellow cover blob and hold the space bar. Some pillars look like they should provide cover, but they don't, so there is some searching around as a demon sets me on fire. The laser rifle actually feels pretty good to shoot—it has a sniping shot and burst fire that can suppress enemies—but sword swipes feel weak and sloppy. Movement is slow and cumbersome. I activate a jetpack to do a leap attack, but instead of the roaring assault I was expecting my Inquisitor silently bunny hops a short distance and enemies die where he lands. Cover fire and allies squads are potentially a neat addition to a genre that often has you pillaging the wilderness alone. There is no co-op campaign play in Inquisitor—Martyr (though you can play co-op outside of the campaign), so a few NPC companions go a long way. Sadly they have only turned up in a few missions so far and after a few hours of play, I can already see a lonesome levelling grind stretching out before me. The skill screens are full of nodes promising tiny percentage increases in melee damage and crit chance. If I do enough ranged damage—many hours' worth judging by the progress bar so far—I will unlock some ranged skills to spend points on. It's not the most exciting prospect. Certain suits of power armour let you blanket an area in micro rockets; others come with jetpacks, or a beacon that can summon turrets. Character growth is driven instead by loot. Items drop occasionally in combat, but so far I have mostly acquired them at the end of the game's quick 15-minute missions. Instead of presenting a contiguous world that you battle through to the end of a lengthy chapter, Inquisitor—Martyr lets you pick from a range of short instances on the star map. If your gear is particularly good against Chaos demons you can prioritise missions on overrun space hulks where the Chaos god Nurgle loves to spread his rot. Once you've cleared out the area, grabbed the necessary intel, or assassinated the required heroes, you extract and earn a pile of cash and a few new bits of wargear. Gear makes you more powerful and gives you new combat skills. Certain suits of power armour let you blanket an area in micro rockets; others come with jetpacks, or a beacon that can summon turrets. A greatsword will fill your taskbar with a variety of slashing attacks, while a chainsword and shield will devote a couple of taskbar slots to sword attacks and a couple to shield abilities. It's reminiscent of Guild Wars 2's decent weapon skill scheme and, like Diablo 3, it keeps the taskbar manageable while asking you to make meaningful decisions about what you slot into your character. It means finding a new type of weapon is exciting, too, and it's probably the main reason I will continue to play for a little while. If I can find a combination of attacks that is consistently fun to use, I might dig into Martyr's wider community metagame. I also like the idea of bite-sized missions that throw up quick rewards, and can see 40k fans enjoying it in a knockabout kind of way. It could be the kind of game you can snack on here or there while the kettle is boiling, but I think the lack of combat polish proves fatal in this genre. Martyr creates an evocative universe of drifting space hulks and blighted planetary locations, but doesn't deliver the essential degree of battle satisfaction that action RPGs require. Combat needs to flow beautifully through hordes of foes. Every ability needs to feel great over and over again. Class development needs to matter. Otherwise, you might as well play Diablo, or Torchlight, Titan Quest, or any number of the amazing action RPGs that have gone before. Alternatively, if you're looking for some session-based Warhammer co-op with great combat, give Vermintide 2 a shot instead.